Edgar Allan Poe has a reputation for mockery and secrecy. He loved to challenge his readers with riddles, hoaxes, and cryptography. He was a talented crypto-analyst and he wrote articles about ‘secret writing’, as he called it. He used this talent for the tale of ‘The Gold Bug’, a story in which a cipher has to be decoded to find a hidden treasure. The tale describes step by step how the code, based on letter substitution, is cracked. Therefore this tale is still used by many universities for introductory classes in cryptography and cybersecurity. Is it a coincidence that several of Poe’s tales carry hints or suggestions of hidden secrets and double meanings; that there is more to the tale than meets the eye? And since Poe had no fear to express unheard of ideas, or even reject the settled scientific and religious opinions of his age, one can only wonder which thoughts he wanted to keep to himself or reserve for future generations who would hopefully understand his messages. 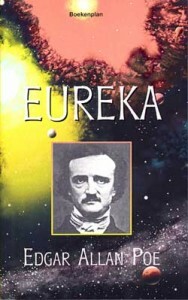 Poe’s most important work, the brilliant and prophetic cosmogony ‘Eureka’[i] also contains hints about cryptography and a hidden secret. The first hint is about the French linguist Jean François Champollion (1790-1832) who solved the mystery of the Egyptian hieroglyphs. This was a feat that caused great excitement in the western world, and it was the beginning of mass tourism into the Middle East and a fascination for its ancient cultures. The second and most direct hint of a hidden secret in Eureka is a message to the readers: “I care not whether my work be read now or by posterity. I can afford to wait a century for readers when God himself has waited six thousand years for an observer. I triumph. I have stolen the golden secret of the Egyptians. I will indulge my sacred fury”. During the past decades, Eureka has been gaining interest in scientific circles, as a precursor of modern cosmology. So there was speculation about the meaning of this message about a stolen Egyptian secret. And it was a big surprise when it was recently discovered that some of the key paragraphs in Eureka are in fact rewritten verses from the Koran. Poe knew the English translation of the Koran, which was published by the British oriëntalist George Sale (1697-1736), and he used that knowledge in his work, like the poem ‘Israfel’ and the tale ‘The Pit and the Pendulum’. And Poe was certainly not the only one because the ‘Orient’ was a source of inspiration for the poets and writers of the American Renaissance, who looked beyond Europe for inspiration. However, it was unknown that Eureka relied so heavily on the Koran. Especially since it concerns the key-paragraphs that deal with the creation of the universe from a unified primordial particle, with the expansion of the universe, with the creation of celestial bodies, and with the existence of multiple universes in space and in time. About the expansion of space and the distribution of matter. We built the heavens with our power and we are extending them. (al-Dhariyat, 47). Then He turned to the sky, which was smoke (Fusillat, 11). About the condensation of matter into celestial bodies. About the Big Crunch and the cyclic universe. Although the Big Bang, an expanding universe, and a multiverse, are well known cosmic ideas nowadays, that may not be the case for the idea of cyclic universes; a ‘multiverse in time’. In western philosophy, the concept of ‘eternal return’ is well known, after Friedrich Nietzsche (1844-1900) gave it a central place in his philosophy. Although Nietzsche knew Poe’s work, it is not known if that inspired him, or if he also got the idea from the Koran. But also in western cosmology, the idea of a repeating universe has been proposed in 2010 by the British astrophysicist Sir Roger Penrose, in his ‘conformal cyclic cosmology’. The idea occurred to Penrose after he observed irregularities in the cosmic background radiation, which can be explained as remaining ‘footprints’ of the previous universe. Poe’s work was and is incredibly important and influential in world literature. So does Eureka make him a surprising link between religion and western thought? Or did he drink from the ideas that float around in the noosphere, waiting to be picked up by fertile minds, to settle and flourish? And did this also happen to others who developed similar ideas as Poe did, like Nietzsche, Friedmann, Lemaître, Einstein, and Penrose? The answers to these questions still have to be given, but it is certain that the basic concepts in modern cosmology have a much longer and more fascinating history than was generally assumed till now.